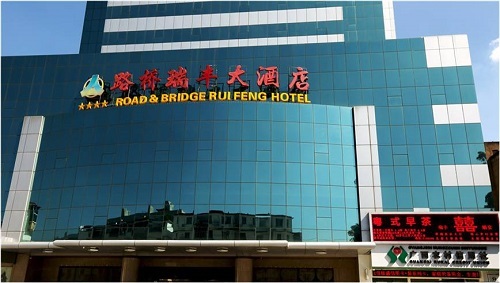 Road and Bridge Ruifeng Hotel of Guangxi is a four-star business conference hotel owned by Guangxi Road and Bridge Ruifeng Hotel Management Co., Ltd., which is affiliated to Guangxi Road and Bridge Engineering Group Co., Ltd. The hotel is equipped with 232 rooms (suites) of different types, such as luxury suites, fashion rooms, luxury rooms and standard rooms with 398 beds. It has banquet halls, multi-functional halls and conference rooms with complete functions, which can also cater for 800 people and hold various large, medium and small meetings. The restaurant can provide Cantonese-style morning tea, Cantonese cuisine and Guangxi ethnic specialty dishes with unique flavor. At the same time, the hotel has fruit coffee leisure bar and boutique shopping mall to offer different kinds of drinks, fruits and local specialties with Guangxi characteristics, and equips recreational facilities such as leisure lounge, gymnasium and calligraphy room to provide leisure and entertainment for guests.